To Halifax first, which reckons house prices rose 1.1% in November compared with the month before, putting their annual rise at 7.7%. The average house price is now an eye-watering £174,910. Harsher critics would suggest the government’s Help to Buy scheme has been so stonkingly successful it’s actually come full-circle, pushing prices up to beyond what most people can afford (or, frankly, see as even remotely reasonable). Osborne et al have clearly realised their ‘stimuli’ are now becoming ‘cash cows’: last week, the Bank of England refocused its Funding for Lending scheme (which allows banks to borrow cheap cash to lend) away from the mortgage market and toward small businesses. Banks, obviously, aren’t happy – but small businesses have continued to suffer despite the recovery everyone’s been banging on about, so it’s only fair, really. Meanwhile, the housebuilding sector should have plenty to be getting on with. It’s often said that to meet demand, we should be building 100,000 more homes a year. With Help to Buy to help it out, the sector really shouldn’t have an excuse for not ramping up those new starts. Any more whining from the likes of the Home Builders Federation about not getting enough support should be met with raised eyebrows in Whitehall: there are already suspicions housebuilders have spent years driving up prices by not starting new projects on land they own, citing lack of demand as an excuse. Procrastination now would only confirm that. And so to E.On, which has announced an average price rise of 3.7% for duel fuel customers. That works out at about £48 a year. Lest we forget, on Monday the government scrapped a raft of green levies which, it hoped, would cut the average bill by £50. British Gas, NPower and SSE all immediately announced reductions or freezes, while E.On muttered something to the effect that it would pass on savings but it wasn’t sure by how much. Now it reckons it has taken into account the government’s changes, but still needs to raise prices. So had David Cameron not decided to ‘get rid of all that green crap’, E.On customers would be facing a price rise of close to £100 a year. Ouch. 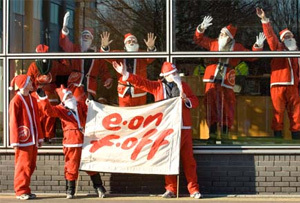 ‘There is no escaping the simple fact that any price rise is unwelcome,’ under-stated E.On chief exec Tony Cocker.